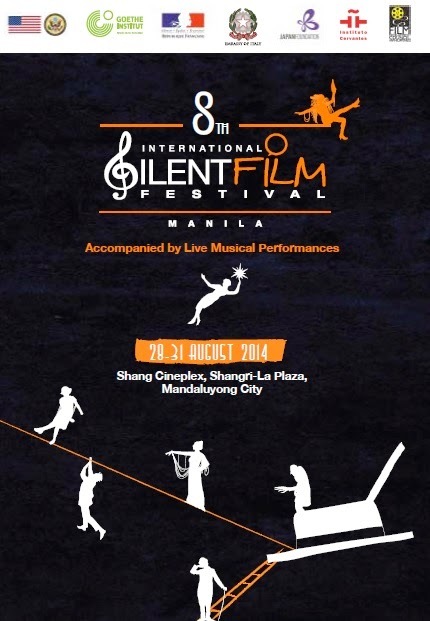 The Annual International Silent Film Festival, the only one of its kind in Asia, returns for its eighth edition at the Shang Cineplex, running from August 28 to 31. There are just seven films in the festival’s lineup, but each of them is a genuine cinematic treasure. As usual, the films will be scored live by musical acts, and this year’s lineup, aside from featuring some of the country’s most notable acts, will include a visiting master pianist from France. Admission is free. Here’s a look at what you can experience this year. MUSIKAL! Is a show that celebrates Filipino pride in musical theater. This musical revue features excerpts from original Filipino Musicals staged in the last five years that have been box office hits, critically acclaimed or artistic breakthroughs in Philippine music theater and performed by leading artists and companies. Songs, dance and production numbers from the hit musicals namely: Katy, Maxie the Musical, ZsaZsa Zaturnnah Ze Muzikal, Rak of Aegis, Rama Hari, Magsimula Ka, Caredivas, Rock Supremo, Sandosenang Sapatos, Bluebird of Happiness, Toilet the Musical, Rivalry, Sa Wakas, Sinta, Noli Me Tangere, Orosman at Zafira, Labaw Donggon, Walang Sugat will be performed by the original cast. Celeste Legaspi anchors the Gala. Gerard Salonga conducts the Philippine Philharmonic Orchestra. Watch the best of 22 original Filipino musicals in one night. Listen to the orchestrated symphonic version of the famous songs from these musicals which will be played by the Philippine Philharmonic Orchestra (PPO)(Chamber group). See the original cast perform and meet them after. The VAMD is accepting proposals for the 2015 Venue Grant Program. Since the Center’s inauguration in 1969, the CCP has been known as venue for contemporary, experimental, and multidisciplinary works. It has also served as a launching pad for artists to enter the local and international mainstream art scene. 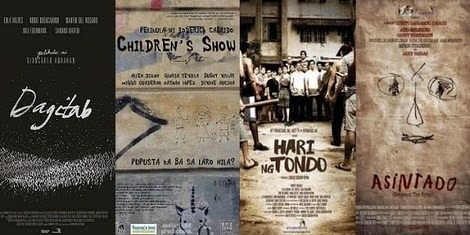 The CCP also serves as an implementing agency for cultural programs and agreements between the Philippines and other countries. All exhibitions held under its Venue Grants Program are non-commercial in nature. Now on its third year, PETA, the country’s pioneering company in the use of theater for education, joins one of the country’s biggest publishing companies, Lampara Publishing House, in enriching the competition with creative workshops to enhance the participants’ storytelling and performance skills. Register now to begin a fun journey of learning, self-discovery and telling of some of the most exciting and value-laden children’s stories! 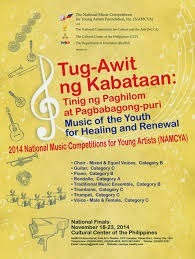 The Application Packet containing all specific required materials must be received by the NAMCYA Secretariat via regular mail (Philippine Postal Corporation), delivery/courier service, or hand carried on or before 5:00 p.m. on Friday, August 8, 2014 for all Instrument competitions except Traditional Musical Ensemble. Application Packets for the Traditional Music Ensemble competition must be received at the NAMCYA Secretariat Office on or before 5:00 p.m. on Friday, October 10, 2014. Belle, Beast, Gaston, Mrs. Potts, Lumiere and other much-loved Beauty and the Beast characters come to life on January 11-25, 2015 as Ovation Productions brings the original Broadway spectacular to the CCP Main Theatre stage! 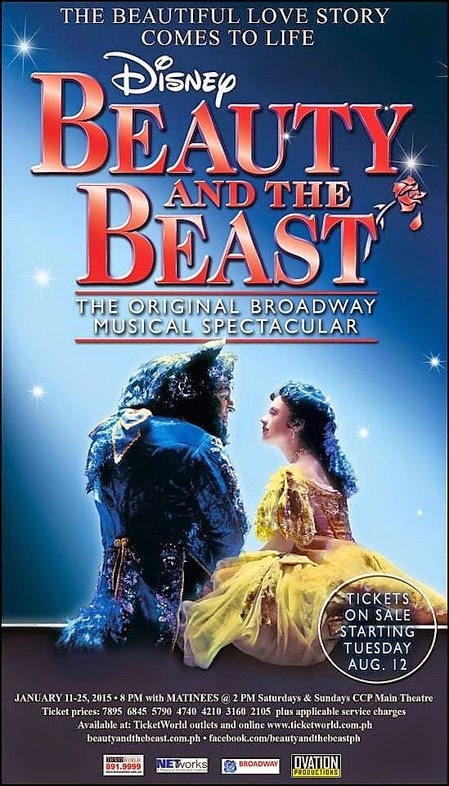 Experience Belle and the Beast’s wonderful and unique love story in this one of a kind Broadway musical which turns 20 years old this year! Tickets go on sale starting Tuesday, August 12. Beauty and the Beast is the classic story of Belle, a young woman in a provincial town, and the Beast, who is really a young prince trapped in a spell placed by an enchantress. If the Beast can learn to love and be loved in return, the curse will end and he will be transformed to his former self. But time is running out. If the Beast does not learn his lesson soon, he and his household will be doomed for all eternity. Chicago: The Musical, featuring its All-Star American cast, will run from December 2 to 21, 2014 at The Theatre at Solaire in Parañaque City. ‘Chicago’ is presented in Manila by Smart Infinity. Set in the roaring '20s, Chicago: The Musical showcases the alluring city of Chicago, giving audiences a killer tale of crime, song, and dance. Most of us probably had our first taste of this hit musical through its 2002 film adaptation which won six Academy Awards. However, there is a richer history and even more interesting trivia about Chicago, now in its 18th year on Broadway. Manila has been home to international productions of world-class musicals like Cats, Mamma Mia, The Phantom of the Opera, and Wicked--all brought into the country by Smart Infinity. To have Chicago staged in the country this year with the All-Star American cast is truly a highly anticipated spectacle. 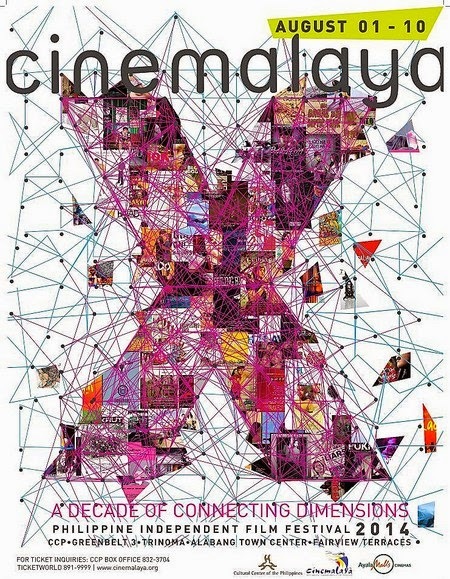 The Cinemalaya Independent Film Festival and Competition, billed as Cinemalaya X this year, marks its 10th anniversary as it opens on August 1-10, 2014 at the Cultural Center of the Philippines, and at satellite venues in Greenbelt Makati, Alabang Town Center, TriNoma and Fairview Terraces, the newest Cinemalaya satellite venue this year, in Quezon City. From the company that brought you eight successful & FUN Le Cabaret Galas, MMQ is pleased to present their new Murder Mystery Dinner Theatre, 2 Saturdays, at Dusit Thani Ballroom September 6 & at RJ’s Bistro September 13, 2014, both at 7pm. 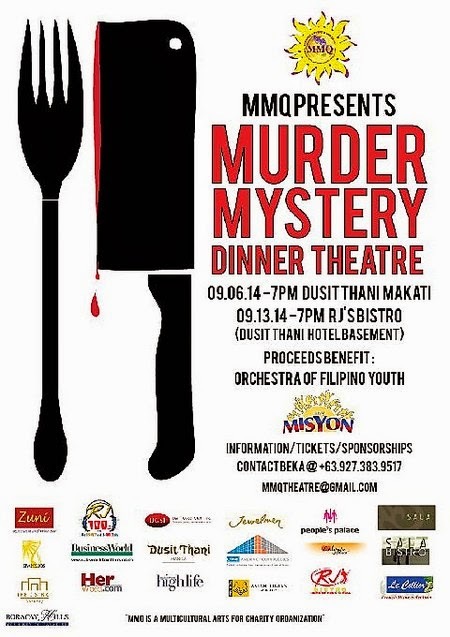 In association with Dusit Thani Hotel & RJ’s Enterprises, MMQ is estatic to present an old fashioned Murder Mystery, with grand prizes for the audience member who correctly guesses WHODUNIT each night, all for CHARITY’S SAKE. This year’s beneficiary is Ang Misyon & the Orchestra of Filipino Youth, led by Artistic Director Jovianny Emmanuel Cruz.